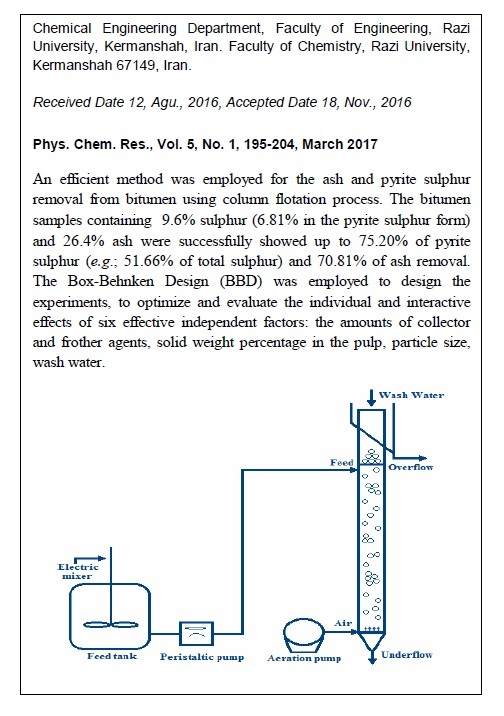 An efficient method was employed for the ash and pyrite sulphur removal from bitumen using column flotation process. The bitumen samples containing 9.6% sulphur (6.81% in the pyrite sulphur form) and 26.4% ash were successfully showed up to 75.20% of pyrite sulphur (e.g. ; 51.66% of total sulphur) and 70.81% of ash removal. The Box-Behnken Design (BBD) was employed to design the experiments, to optimize and evaluate the individual and interactive effects of six effective independent factors: the amounts of collector and frother agents, solid weight percentage in the pulp, particle size, wash water rate and feed rate. In order to investigate system a laboratory scale rig was built. In all experiments, pine oil and kerosene were considered as frother and collector agents, respectively. The best result for column flotation process were amount of collector (1.5 kg/tbitumen), amount of frother (0.3 ppm), pulp content (10% of solid), particle size (100 mesh), wash water rate (0.4 L/min), feed rate (1.5 L/min) and flotation time (10 min). 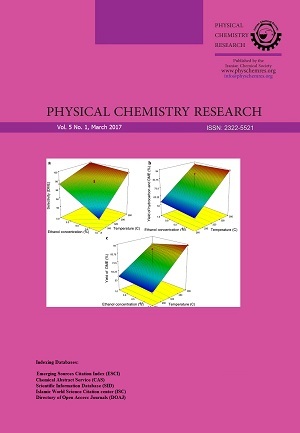 The coefficient of determination, R2, showed that the RSM model can specify the variations with the accuracy of 0.924 and 0.938 for the percentage of ash and pyrite sulphur removal from bitumen, respectively.